FLY AWAY: Nothing says “dead heat of summer” like the buzzing of big, lazy flies. 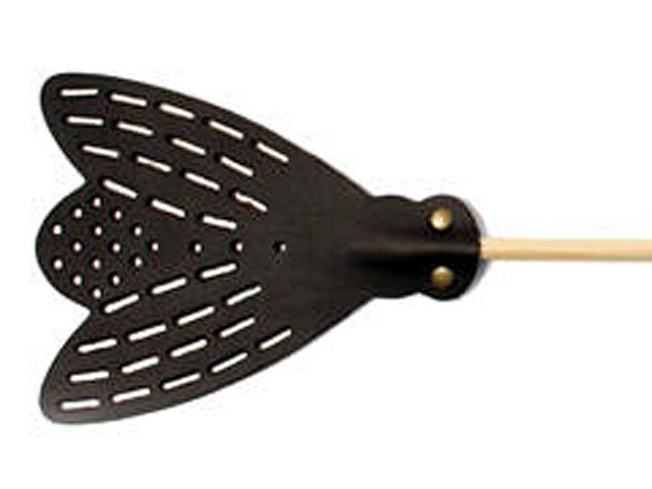 Dispatch them swiftly – and in style – with a luxe swatter that’s part wood (the slender handle), part leather (the business end). Made in Finland, the elegant item is available in light or dark brown at Takashimaya, 693 Fifth Avenue near 54th Street, 212-350-0100. NO DEAL: In “Cheap: the High Cost of Discount Culture” (Penguin Press), Atlantic Monthly correspondent Ellen Ruppel Shell looks at how, exactly, the early American values of quality and durability were replaced by today’s discount-obsessed (and disposable-goods-filled) society. In other words, when did we become a nation willing to cause a stampede for a $49 laptop? $25.95 at St. Marks Bookshop, 31 3rd Avenue near 9th Street; 212-260-7853. COTTON TO IT: Attention, men: when the flip flop is just not shoe enough for whatever you’re wearing – and you need to give your leather mules a break – consider, if you haven’t already, the canvas espadrille. These navy ones from A.P.C. at Bird are just about as classic as it gets (worn-in-Spain-since-the-14th-century classic, as Bird reminds us), and besides, they’re on sale for $39. Bird, 203 Grand Street near Bedford Avenue, Williamsburg, Brooklyn; 718-388-1655.